“The Terrace Apartment” is situated at treetop level on one of the oldest, most beautiful and the most shaded cobblestone streets of Old San Juan. The apartment is on the last floor and there is no elevator. Its positioning is just 100 meters from La Puerta de San Juan(the gate of San Juan), El Paseo de la Princesa, the harbor and the Governor’s residence, and 150 meters from the Cathedral. The location is perfect for quick access to the city’s historic sites and great shopping and dining experiences. The house was originally restored in the 1800’s and is loaded with charm. You enter through a comfortable shared lobby and ascend two floors by stairway to an Air Conditioned bedroom with a King size bed, twin love seat rocker-recliner and private bathroom. 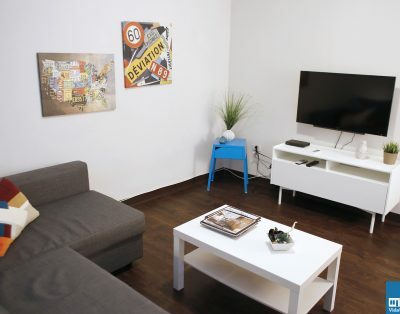 The apartment offers satellite television, a stereo system, Wi-Fi capability, and a 120 volt alternate energy system for uninterrupted power supply capability. It features wood inlaid tile floors, high ceilings, temperature controlled ceiling fan, and opens up to a huge covered terrace for personal lounging and dining. A hammock, table and chairs, small fridge, two burner hotplate, microwave and stainless steel BBQ are provided for your convenience. This is a must for all who want to enjoy an incredible penthouse style ambiance and also relax in the warmth of its “old colonial home” Caribbean atmosphere.